This article was published in the Spring 2012 Baseball Research Journal. The night of July 15, 1952, looked unpromising for baseball in Beaumont, Texas.1 Storm clouds and a forecast of rain kept attendance low as the visiting Tulsa Oilers prepared for a Texas League night game. Only 335 customers would eventually file through the turnstiles, the lowest crowd count of the year to date at Stuart Stadium.2 Gloomy weather notwithstanding, the game began on time. Former major leaguer and veteran left-hander Johnny Vander Meer warmed up for Tulsa. He waited on the bench as his teammates staked him to an uncharacteristic two run lead in the top of the first inning, and then took the mound. Johnny set the Roughnecks down in order in the first. Beaumont’s Stuart Stadium, built in 1923, featured a right field fence only 260 feet down the line from home plate. A vertical line had been painted on the fence in right center. Balls hit to the left of the line were home runs, while those clearing the fence to the right in fair territory were ground rule doubles.3 The ground rule partly compensated for the odd distance, but even a pop fly from a late-swinging right-handed hitter could disappear over the short right-field fence for a double. Stuart Stadium was not a pitcher’s ballpark. After a routine out to begin Beaumont’s half of the inning, Tulsa third baseman Jack Weisenburger handled a hot grounder and made an on-target throw to first base. Earl York, Tulsa’s first baseman and leading home-run hitter, dropped the ball for an error. Johnny fanned the next hitter for the second out. During his major league career, The Dutch Master had possessed a lively fast ball and eventually developed an effective sinker. He had also carried a reputation for wildness and a tendency to lose command of the plate that could erupt at any time. At 37, his major league career behind him, control was still an issue for Vander Meer at times. He hit the next batter, Al Pilarcik, and walked Charles Bell to load the bases. Johnny Vander Meer, certainly not for the first time in his long and storied career, was in a jam. On March 10, 1952, Tulsa Oiler batteries opened spring training in Eustis, Florida. Johnny Vander Meer was one of a handful of former major leaguers competing for a job, along with Kent Peterson and Niles Jordan, both southpaws, and right-hander Leo Cristante. Probably as a courtesy to a former Redleg, Johnny had worked out with the parent Cincinnati club for two weeks until reporting to the Oiler camp on March 13. He threw his first batting practice on March 14, and Tulsa manager Joe Schulz pronounced him in “…excellent physical condition.”7Johnny’s physical wellness was a question mark. In the previous three seasons, his won-lost record with two major and one minor league team totaled only 16 games because of arm trouble. At 37, Johnny’s place in the Oiler pitching lineup must have been problematic as spring training began. On March 29, Vandy made his first appearance for Tulsa in an exhibition game, pitching the 7th, 8th and 9th innings against the Chattanooga Lookouts, and yielding only an infield hit.8 Most of the pitching work fell to younger Oiler hopefuls during the preseason, signaling plans for a limited role for Johnny. His next spring training pitching appearance consisted of four scoreless innings against the Memphis Chicks on April 7.9 On April 11, the day before the season opener, Manager Schulz assessed his team’s prospects: “…top flight defense, good speed, some good pitching, but needs more power.”10 His words proved prophetic. The Dallas Eagles beat the Oilers 13-6 in the away season opener. On April 15, the Oilers dropped their third in a row, 4–0, before a home opening crowd of 5,320, forecasting a troubling lack of ability to score runs.11 John’s first start came on April 22, eleven days into the season, another indication of his marginal status on the pitching staff. He acquitted himself well nevertheless, pitching eight innings and giving up just one earned run. A pinch hitter replaced him in the eighth, and Johnny lost the game to Elroy Face. According to the Tulsa World reporter, he showed “some wildness.”12 The Dutch Master’s demon had accompanied him to Tulsa. Tulsa mercifully failed to score in their half of the ninth inning, and the suspense continued. Beaumont’s last three outs stood between Johnny and a no-hitter. The first two hitters made routine outs, and Johnny walked the cleanup hitter, Jim Greengrass, on a 3–1 pitch. Marshall Carlson, Beaumont’s center fielder, ran the count to 2–2. He caught enough of the next pitch to send it to right field, where the short right field fence loomed. The damp air and perchance benign baseball Gods kept the ball in the park, and guided it into the glove of Tulsa’s Francis Brown. Johnny had his third no-hitter in professional baseball. As he watched the Tulsa team mob their pitcher on the field, Beaumont manager Harry Craft may have been thinking of Ebbets Field, 14 years earlier, when he squeezed the final fly ball hit by Leo Durocher that had secured Vander Meer’s double no-hitter and his place in baseball history. Vandy sat the Roughnecks down in order in six of nine innings. Twelve balls made it to the outfield for putouts. As the Oilers celebrated in Beaumont, Lois Vander Meer woke her daughter Evelyn and told her that her father had just pitched a no-hitter. Johnny’s achievement made sports headlines in Tulsa, but elsewhere drew substantially the same reaction as that of his daughter Evelyn. Baseball was still the national pastime in 1952, but Beaumont and Brooklyn were worlds apart as stages for pitching triumphs. Also, national sports attention centered on the Olympic games in Helsinki that summer. The ever present Cold War had boiled down to the battle between the US and Russia for Olympic medals. On August 1 at Tulsa, Vandy lost to Beaumont. He gave up runs through the fifth inning, but then began putting up goose eggs, eventually running up a scoreless string of 22 innings. He shut out Beaumont on August 5, and Houston on August 11. In the latter game the veteran left hander fanned seven and walked one in intense 90-degree heat. The string of scoreless innings ended August 16 in the first inning as Houston assembled a run from two singles and a fielder’s choice. Johnny pitched well enough to keep Tulsa in the game through nine innings, however, and then watched from the dugout as the two teams played 22 innings, the second longest game in Texas League history.27 Tulsa won 6–5. Johnny had thrown his last pitch for Tulsa. At season’s end on September 7, the Oilers fielded a makeshift lineup before just 835 fans.32 Prospects had moved up to other teams. Johnny’s name never appeared in another account of a Tulsa game, and the Vander Meers may have left town by then. Johnny had put in a full, productive season for Tulsa, but he had bought a half interest in a hardware store in Tampa, and his reason for being in Tulsa had disappeared with playoff elimination. 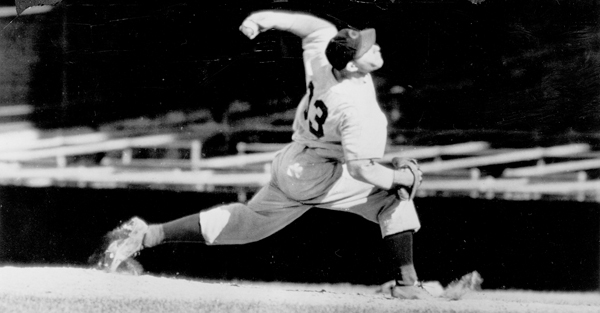 In the seventy-plus years since 1938, no pitcher has thrown consecutive no-hitters in the majors. Ewell Blackwell came close in 1947, losing his second in a row after 8 1?3 innings.37 With today’s pitching specialization, even two complete games in a row garner special recognition, so Johnny’s record is probably safe. The Dutch Master won 119 and lost 121 in the majors. His minor league record was only slightly better, at 76–73. Vander Meer’s career totals pale by comparison to pitchers ensconced in Cooperstown. His name, however, is branded onto the collective baseball consciousness. Long before that rainy night in Beaumont, he had joined the fraternity of players like Don Larsen, Bobby Thomson, and Bucky Dent, who each rose to one glorious occasion and captured the enduring imagination of the baseball world. Biographical note: The author, as a 13-year-old baseball enthusiast, followed the fortunes of the 1952 Tulsa Oilers closely, and attended as many games as the thirty-five cent bleacher admission permitted. Vander Meer’s no-hitter, sadly, was out of town and our radio was broken than night. ERNEST J. GREEN is a former Chair of SABR’s Minor League Committee, and is author of the baseball travel book, "The Diamonds of Dixie." Other contributions to the Baseball Research Journal include “Minor League Big Guns,” a comparison of career minor league top home run hitters. He lives near Washington, DC, within easy driving distance of five minor league baseball teams. 1. Approximately half the sources consulted for this article cited the wrong date and often the wrong opposing team for Vander Meer's minor league no-hitter. The problem apparently stems from the usually reliable The Texas League (Austin, TX: Eakin Press, 1987) by Bill O Neal. On page 109 the correct date is mentioned, July 15, but the opposing team is misidentified as the Shreveport Sports. A second reference to the game correctly identifies the team opposing Tulsa as Beaumont, but incorrectly furnishes a date of July 12, 1952, instead of July 15 of that year (315). 2. Tulsa World, July 16, 1952, 20. 3. Michael Benson, Ballparks of North America. Jefferson, NC: McFarland, 1989, 28. 4. The most detailed accounts of the game were reported in The Tulsa Tribune and Tulsa World on July 16, 1952. 5. SABR Minor League Encyclopedia, www.minors.sabr.org. 6. Vander Meer has not been the subject of a full length biography. His professional career can be reconstructed by combining major league pitching performances in John Thorn and Pete Palmer (Eds.) Total Baseball, 2nd ed., NY: Warner Books, 1991, 1846, and the SABR Minor Leagues Database. 7. Tulsa World, March 14, 1952. 8. Tulsa World, March 30, 1952. 9. Tulsa World, April 8, 1952. 10. Tulsa World, April 11, 1952. 11. Tulsa World, April 16, 1952. 12. Tulsa World, April 22, 1952. 13. Tulsa World, May 1, 1952. 14. Tulsa World, June 4, 1952. 15. Tulsa World, June 7, 1952. 16. Tulsa World, June 20, 1952. 17. Tulsa World, June 29, 1952. The breakdown of attendance by race was possible since at Tulsa’s Texas League Park in 1952, separate turnstiles and segregated seating was the norm. 18. Tulsa World, July 2, 1952. 19. Tulsa World, July 5, 1952. 20. Tulsa World, July 10, 1952. 21. The Tulsa Tribune, July 13, 1952. 22. Game accounts are as reported by Tulsa World (morning) and The Tulsa Tribune (evening) editions for July 16, 1952. 23. The Tulsa Tribune, July 16, 1952. 24. After the game, Johnny credited “tight defense” as a reason for his pitching achievement, but according to the Tulsa World reporter at the game, only Grammas play was more than routine. 25. The Tulsa Tribune, July 16, 1952. 26. Tulsa World, July 23, 1952. 27. The author, as a 13-year-old Tulsa Oiler baseball fanatic, attended the game and sat through every inning, returning home about 3 A.M. to be greeted by an unhappy mother. 28. Tulsa World, August 22, 1952. 29. Tulsa World, August 27, 1952. 30. Tulsa World, September 2, 1952. 31. Tulsa World, September 5, 1952. 32. Tulsa World, September 8, 1952. 33. Wayne McCombs, Let’s Gooooo Tulsa: The History and Record Book of Professional Baseball in Tulsa Oklahoma 1905–1989. Claremore, OK: 1990, 108. 34. Minor League Encyclopedia, op. cit. 35. Robert Weintraub, “The Legend of Double No Hit,” ESPN Magazine, April 23, 2007, 2. 36. Lloyd Johnson and Miles Wolff, The Encyclopedia of Minor League Baseball, 2nd ed. Durham, NC: Baseball America, 1997, 419. 37. Ira Berkow, “Vander Meer’s Feat May Never Be Bettered,” The New York Times, October 8, 1997. Read the BRJ on your computer or e-reader.